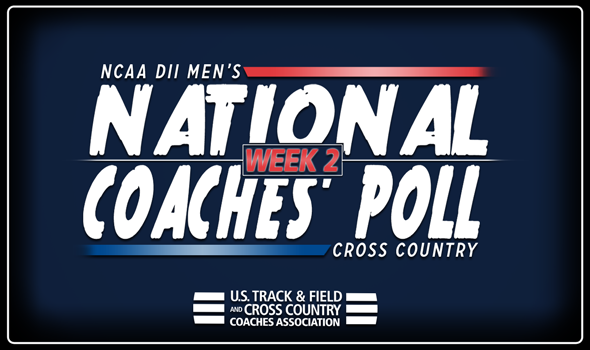 NEW ORLEANS – As yesterday’s Regional Rankings should have indicated, there was very little movement to be had in Week Two of NCAA Division II Men’s Cross Country National Coaches’ Poll, that was released by the U.S. Track & Field and Cross Country Coaches’ Association (USTFCCCA) on Wednesday. While 12 of the top-25 teams did have some sort of movement the biggest improvement by any program was one spot while the largest drop by any team was just two. For the third-straight week Adams State collected all eight first places votes to remain as the No. 1 team in the country. It is the second consecutive year that the Grizzlies have opened the season as the top team for at least the first three polls. Adams State has been off from competition since a third-place performance at the Mountaineer/Cowboy Invite. They will be back on the course with the Fort Hays State Tiger Open on October 13. The rest of the top of the poll remained the same as No. 2 Colorado Mines, No. 3 Grand Valley State, No. 4 Western State and No. 5 Chico State rounded out the top-five. Colorado Mines has been off since a win at the Colorado College Invitational on September 8. They will meet rival Adams State in their next race at the Tiger Open. Grand Valley State will be in action this weekend with the Lakefront Invitational on Saturday. Western State is coming off a win a couple weeks ago from its Mountaineer/Cowboy Invite and will race again with the Lewis University Conference Cross-Over on October 6. Chico State will take to the course for the first time this season this Saturday at the Capital Cross Challenge. The only movement in the top-10 belonged to No. 6 Augustana (S.D.) and No. 7 Queens (N.C.) who traded places from the previous poll. Augustana finished third at the Brissman/Lundeen Invitational this past weekend while Queens was off. Both teams will be back in action this weekend. The rest of the top-10 was made up by No. 8 CSU-Pueblo, No. 9 Southern Indiana, and No. 10 Mount Olive. All three teams were off from competition. The only other positive moves in the poll were one spot jumps by No. 13 Dallas Baptist, No. 14 Simon Fraser, No. 15 American International, No. 17 Sioux Falls, No. 18 Walsh and No. 20 Alaska Anchorage. No teams dropped out of the top-25 which also meant that no new programs joined the poll. Shippensburg, Embry-Riddle (Fla.) and Cedarville also received votes.